"Heart attack" is often the term used to describe "myocardial infarction" which describes the situation when a coronary artery is suddenly occluded with a blood clot causing immediate deprivation of blood supply to part of the heart muscle. This is manifested as sudden onset chest pain (like angina) without any physical effort. This is an emergency situation and treatment should be administered as soon as possible to relieve the obstruction and allow blood to reach the heart muscle. 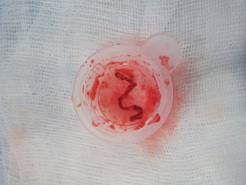 Treatment can either be in the form of a clot-dissolving injection or more recently with an emergency procedure called coronary angiogram and angioplasty whereby the occluded artery is identified using x-ray and the blockage is relieved mechanically with special equipment (balloons and stents).